Managing the fund, overseeing its investment and maintaining tax records. Filing tax returns and providing an independent audit. Providing the services of experienced grant professionals who know the the community, its needs, and its organizations. Our staff can assist in matching your interests with the needs of the organizations in the County. Ensuring that grants are always awarded in the name of your fund. Issuing regular financial reports detailing the status of the fund. How Do I Create A Fund? 1) Decide when to give. You can create your fund now, establish it in your will, or create it through a trust arrangement that benefits your family as well as charity. You may give in honor of an anniversary, to celebrate a special event, or to support a cause. Tax deductions are earned at the time of your gift, while grants awarded from a fund will continue into the future. 2) Decide what to give. Almost any kind of asset can be used to start a fund, such as cash, publicly traded securities, proceeds from a 401K or 403B, life insurance, real estate, tangible personal property and other like assets. We can also discuss other options with you, such as bequests, charitable remainder unitrusts, charitable remainder annuity trusts, charitable lead trusts, pooled income funds, charitable gift annuities, life income and deferred charitable gift annuities. 3) Choose the name of your fund. Most of our funds are named for the donor’s family or as a memorial to someone special to you. Every grant from this fund will carry the name. If you prefer anonymity, you may choose a name that reflects your fund’s charitable purposes. NOTE: It is altogether acceptable that you make your donation to the Foundation’s General Fund. This Fund is used for the very important purpose of meeting various ongoing community needs. Unrestricted Funds offer the broadest giving option, allowing grants to be made wherever our board determines our community’s needs are greatest. Field of Interest Funds create grants that meet needs in a particular field or geographic area that is of interest to you. Donor Advised Funds enable you to recommend specific organizations to receive grants. Scholarship Funds help students pursue academic goals. You may define guidelines for candidacy, the advisory committee, the school and the award itself. Designated Funds let you support specific organization while we make sure that grants to these groups remain relevant over time and responsive to changing circumstances. Organizational Endowment Funds are established by nonprofit organizations to provide income to them. We will handle all administrative and investment responsibilities, freeing the organization to pursue its charitable mission. The Jeri Bigart Memorial Fund was established by Mr. Eugene Bigart in memory of his wife. The fund assists deserving students attending a vocational school. The Boy Scout Troop 111 Fund consists of funds bequeathed to the troop for its ongoing use. The Ben Franklin Fund was created by way of a bequest in Ben Franklin’s will. Annually, the Foundation sponsors a Community Service Award named in Ben Franklin’s behalf. The winner presents $1000 from this fund to a charity of his or her choice. The Charles Frederick Fund was created by the family and friends of Charles Frederick, a founder of the Foundation and member of the Board at the time of his death. It is a discretionary fund to be used by the Board. The General Fund is by far the largest and is comprised of many gifts, but principally made up of a bequest from the late Marie Stemmler of White Mills. This fund is used at the discretion of the board. The Aaron Hocker Fund was created by the family and friends of the late Aaron Hocker for the purpose of extending aid to students and others studying in the health care field. The Fund also makes contributions to organizations in support of health care issues. 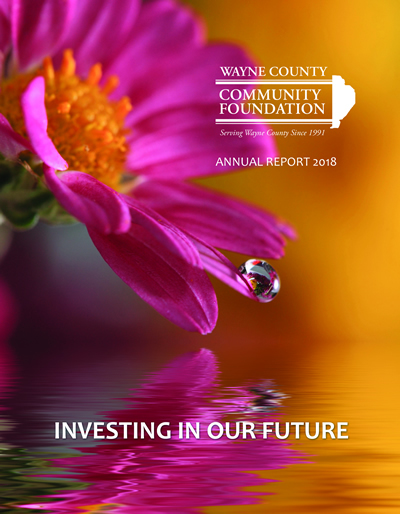 The Wayne Library Authority Fund was established by interested citizens to aid the county’s libraries. The Wayne Sports Hall of Fame Fund was established to further sports opportunities for the youth of Wayne County. The Robert and Inger Stovall Memorial Fund funds two scholarships one at St. Vincent’s School and the other at Honesdale High School. The Rotary Fund gives grants to community projects via the Rotary Club of Honesdale. The Edwin J. Thomas Fund provides for scholarships and also funds community projects. The Robert Zabady Fund recognizes the substantial support given to our Foundation by Mr. Zabady. The fund provides for an annual scholarship. The Jerry and Marilyn Swendsen “Greater Good of Honesdale” Fund is a donor-advised fund. The Albert S. Lipperini Scholarship Fund established by his friends, honors the late Mr. Lipperini. The Leon Scudder Fund was created by a substantial bequest to the Foundation which establishes an endowment for scholarships. 1) Discuss your overall philanthropic goals with your family members and legal or tax advisors. 2) Decide how much you can afford to give. 3) Determine causes or organizations that will use your donations to meet the goals you support. 4) Meet with us to discuss your plan. Ask questions, explore the different gift vehicles available to you and review the documents needed to implement your plan. 5) Share the documents with your family and your professional advisors. 6) Transfer your gift to us. 7) Review our confirmation of your completed gift and the ongoing progress of grants that are awarded from your fund.